It’s a commonplace of Verdi scholarship that the composer’s “big three” operas of the early 1850s – Il Trovatore, Rigoletto and La Traviata – were game-changers for him in that they announced a consistent mature style in addition to introducing tunes so catchy they hold their popularity today. 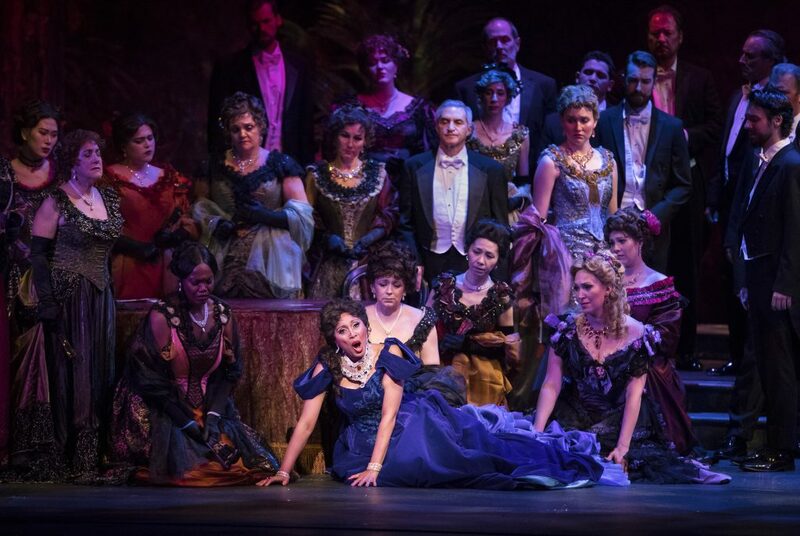 All of which is true, but it takes an especially sensitive and musical performance to really bring that out in a box office chestnut like La Traviata, which opened the Palm Beach Opera’s current season last weekend at the Kravis Center. Fortunately, this production offered just that kind of performance, thanks in large measure to conductor Antonello Allemandi, but also to several of its lead performances. I saw the Saturday night performance, which featured the secondary cast of Jacqueline Echols as Violetta opposite Derrek Stark as Alfredo. 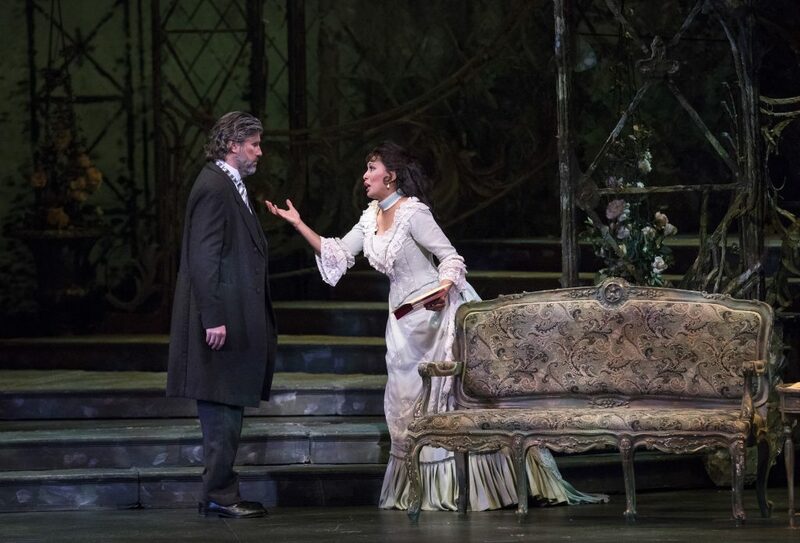 Directed by Fabio Ceresa, a young Italian director who cut his teeth at La Scala in Milan, and presented in traditional fashion with lush sets from Chicago’s Lyric Opera, this Traviata (returning to Palm Beach Opera after just six years) looked good and moved along crisply. As Violetta, Echols was tender, vulnerable and believable, and not incidentally looked terrific on stage in a beautiful red gown in Act I and an equally lovely white one in Act II. 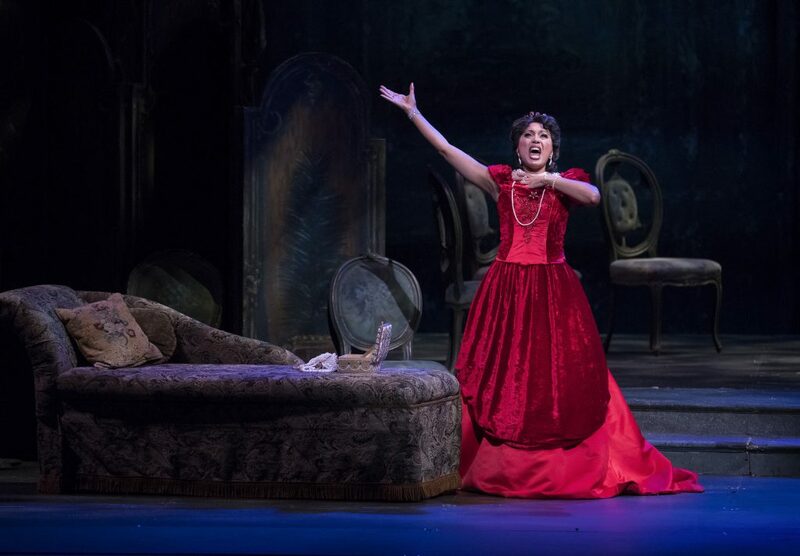 She has a lightly colored, very agile soprano that was sweetly endearing throughout the evening, and at its best in an aria like “Addio, del passato,” in which her attention to the text and commitment to the role made Violetta’s final moments moving. She also handled the “Sempre libera” cabaletta with great skill (and a nice high E-flat) if not overwhelming power; she knows how to use her instrument for maximum effect, and in this case, it was for a gentle, kind Violetta whose fate the large audience Saturday night was keenly interested in. She was a Mimí-like Violetta, and completely engaging thereby. He seemed uncomfortable in moving his body around on stage, and so we didn’t get the hothead side of Alfredo’s character, a man who has no trouble asserting himself and taking center stage. That seems to me to be a consequence of limited experience rather than ability. With more roles, Stark will learn how to physically inhabit his characters, not just sing them with commendable accuracy, which he did even when he seemed to be holding back, as he did throughout Act I. The Italian baritone Massimo Cavalletti, on the other hand, was a superb Germont, with a big, strong voice that brought crackling energy to Act II and which showed off its handsome coloring in a very fine “Di Provenza il mar.” Only a little more identification with the impetuousness of his decision to confront Violetta in the first place would have been welcome, so that his remorse in Act III would have landed with more authority. Two promising Young Artist voices, mezzo Natalie Rose Havens and bass-baritone Ted Allen Pickell, stood out as Flora and the Marquis d’Obigny, respectively, and Greg Ritchey’s chorus sang admirably well. The dancers in Act II, who came from Ballet Palm Beach, made an attractive appearance; choreographer Colleen Smith’s movements, while they didn’t reflect any of the fire of the matador story they accompanied, were nonetheless elegant and clean. Desmond Heely’s sets and costumes were a joy to behold, and Stuart Duke’s lighting touches in the opening of the window in Act III and the false-rejuvenation spot on Violetta at the end were very effective. Director Ceresa’s focus on the lovesickness of Alfredo in Act I took some of the sparkle out of the proceedings, and the Libiamo in Act I was too limp because of it (they’re toasting to drinking, not placing a big order for soy milk). And in Act II, he tended to crowd his chorus downstage, all on one side, and make them stand there, which, while it allows the focus to remain on the lead singers, strikes me as unrealistic. Similarly, the giant Act II, Scene I set was mostly uninhabited; a country house like that in the mid-19th century would have had more domestic staff than just Annina (sung well by Emily Blair). Again, a little more realism would have deepened the experience without detracting from the drama. 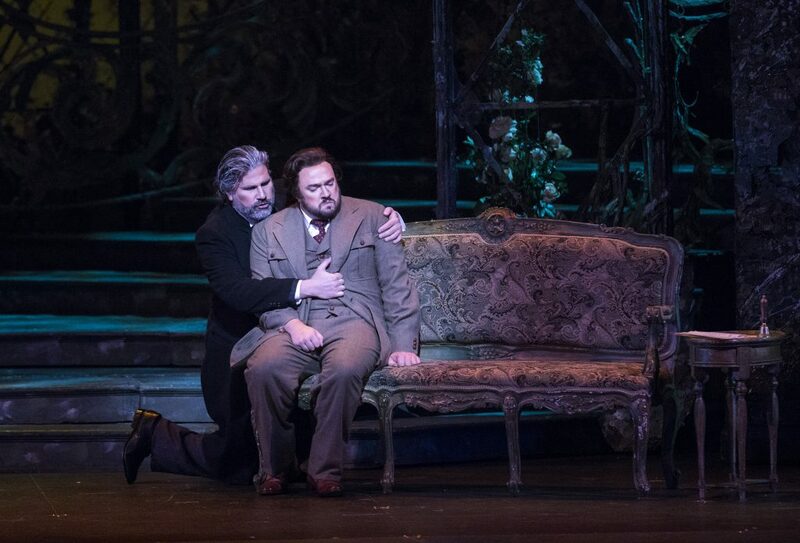 Perhaps the most outstanding aspect of this overall very good Traviata was the peerless conducting of Antonello Allemandi, who led the company’s 2017 production of Rigoletto. Rarely have I ever heard the Palm Beach Opera Orchestra play so flawlessly, with such excellent intonation, string unity and attention to dynamic contrast. Allemandi’s tempos were perfectly chosen, so that the attentive listener could hear Verdi’s mastery of drama laid bare; the composer knew precisely how to drive a narrative, and Allemandi and his orchestral colleagues demonstrated it brilliantly. With the possible exception of a slightly heavy death march in the final pages under Violetta’s last moments, Allemandi never covered the singers, and was clearly communicating with them every step of the way to make the most of this great score. He ended up making a persuasive case for Traviata, hardly necessary for one of the world’s most popular operas, but entirely worth having.